The Samsung Business Futurescape events in London, Samsung will reveal what the future of the workplace will look like in its ‘Future of Work’ report. The rising trend in wearable technology is set to infiltrate the workplace, according to Samsung, which has seen a rise in enquiries for developing wearable technology in a number of industry sectors. The Future of Work whitepaper, created in partnership with Ovum Analysts, also reveals an ever-shortening bridge between personal and workplace technology preferences, with applications taking force in the world of work and up to 78% of people using their own devices for work. Samsung’s Business Enterprise operation research details key opportunities for employers as smartphone penetration reaches 75% of the market, and the worker-consumer relationship blurs. Alongside the increase in wearable tech at work, the study also reveals that employees are setting up their own applications at work, for example cloud file sync and share services, due to IT departments falling short in resources for workers. Only 14% prefer to use applications supplied by their employer with almost a fifth (18%) admitting that their employers’ IT departments don’t provide them with the applications that they need to be able to do their jobs. Over half (54%) of workers use instant messaging (IM) or web phone call technology (VoIP) while at work, with 30% of those having installed the relevant apps themselves. Whilst the importance of communication through IM or VoIP services isn’t as high on the agenda, employers are seemingly more focused on providing sufficient file sharing solutions, with 35% providing the right technology for this function. Highlighting the ever-blending relationship between work and life, Samsung’s whitepaper points to the beginning of the end of the 9 to 5 along with 42% of employees strongly agreeing with the idea of being able to access work emails and apps outside of official working hours. 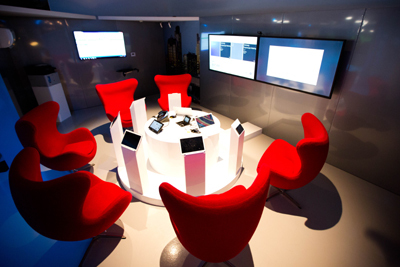 Also set to be revealed at Samsung’s Futurescape events in London will be a merge between the physical and the virtual, with boardrooms set to evolve into a more futuristic state including high-tech solutions for conferencing. This will enable co-workers from around the world work side by side, with no airline ticket purchased saving both time and resources, something every economy will benefit from. Looking deeper into the trend, the more time critical enterprises and support services are in the lead; thanks to Machine to Machine technology and the Internet of Things hands-on professionals are able to communicate effectively while on the job whether they are a paramedic at the scene of emergency or a mechanic on the roadside.